One of my first recipe posts was a chicken and butternut squash curry, which I must say was pretty damn tasty. Since then I've had half a jar of balti paste left and have been trying to find something a little different to do with it. So I looked at the 'recipes' that were stuck to the lid of the balti paste and came across garlic chicken curry... sounds tasty! I tweaked the recipe a bit; and came up with this. The perfect Friday night meal - enjoy! Start by frying your chopped onion and garlic in a little oil - I used about five cloves. Cook for about 5 minutes until softened. Add approx 3 tablespoons of balti paste and cook with the onions and garlic for another 2 minutes. Then add the chopped tomatoes, a squeeze of tomato purée and about 200ml of chicken stock. Add the chicken and leave to simmer for about 30 minutes with a lid on. 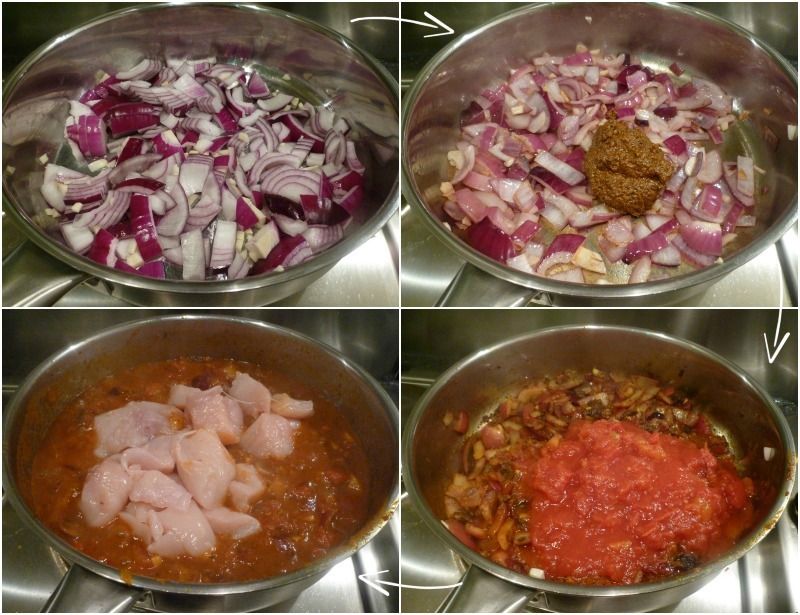 Cooking the chicken like this (rather than frying with the onions) means it remains succulent and tasty. Once cooked, stir in two tablespoons of crème fraiche. Serve with basmati rice and mango chutney. Enjoy! Looks amazing! I love homemade curry, especially on a friday night! NOM NOM NOM!! looks delicious! I love how your blog is so versatile!